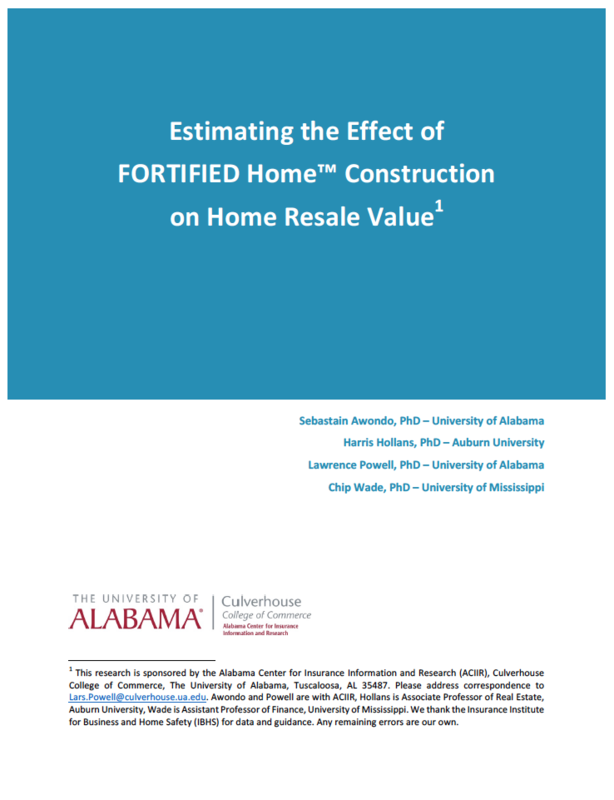 A new study on the resale value of FORTIFIED home construction by The Alabama Center for Insurance and Information, “Estimating the Effect of FORTIFIED™ Home Construction on Home Resale Value,” is about the effect of IBHS FORTIFIED Home™ designations on home values in Mobile and Baldwin counties in Alabama. ACIIR’s study found that switching from a conventional construction standard to a Fortified designation increases the value of a home by nearly 7 percent—holding all other variables constant. Our findings suggest that building Fortified houses or retrofitting houses to meet Fortified standards is an economically sound investment. The additional cost of building or retrofitting is frequently is less than 7 percent of home value; therefore, the benefit of a Fortified designation is very likely to outweigh costs. This is without considering other direct benefits such as insurance premium discounts, potential uninsured rebuilding costs, and the inconvenience of temporary housing following a disaster. ACIIR adds that given the robustness of statistical results, they believe it appropriate for appraisers and financial institutions to reflect Fortified designations in appraisals for use in the mortgage process. In addition to ACIIR staff, the report is co-authored with professors from Auburn University and the University of Mississippi with expertise in finance and real estate.